Stuart Kettlewell thinks lifting the Scottish Challenge Cup by beating Connah's Quay Nomads will help Ross County stay ahead in the title race. The Championship leaders came from behind to win 3-1 and prevent the Welsh becoming the first non-Scottish side to win the competition. "It is something that puts some icing on the cake," County's co-manager said. "And we just hope that it is something that also can be the catalyst for us in the next eight games." As Dundee United beat Alloa Athletic 2-1 to narrow the gap at the top of the league to five points, Michael Bakare gave the Nomads a deserved lead at the break at Caledonian Stadium, Inverness. But substitute Josh Mullin scored twice within three minutes and Jamie Lindsay added a third as County made second-half pressure tell in the final 15 minutes. "We've deserved it off the back of the 90 minutes today and I think we've deserved it off the performances up to this point in the season as well," Kettlewell told BBC Scotland. The County manager admitted that his players had initially found it difficult to cope with Nomads' famed physicality as well as a stiff breeze. "It is hard to get any fluency in the game and you'll have a moan and a groan about it, but it is always within the boundaries of the game," he said. "In the second half, we looked a bit more assured and we certainly moved the ball about really well." 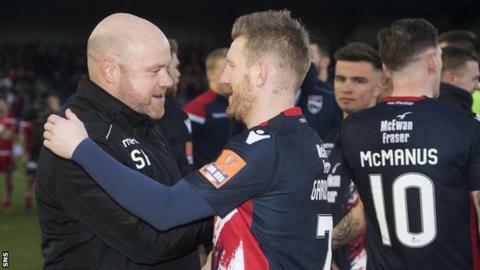 Kettlewell thought Michael Gardyne was "terrific" despite being man-marked throughout the game - and also praised the impact of fellow forward Mullin, who he said had been "brilliant all season". It is a first trophy for co-managers Steven Ferguson and Kettlewell, who admitted they were still rookies. "This whole process has been a learning curve for us and to get to this point and win your first piece of silverware, I think we're just over a year in the job, is really good," he said. Inverness-born Nomads manager Andy Morrison was "proud" of his players despite failing to realise his "dream" of a victorious homecoming. "We had good chances and we're just so disappointed to lose it in the end - we should have been two or three up," he said. "I asked them to come here and make an impression and they've made a huge impression and made a very good outfit - a Scottish Premiership team for next season - ask questions of themselves." The Welsh Premier league title hopefuls defeated another Championship side, Falkirk, as well as Coleraine, Queen's Park and Edinburgh City to become the first non-Scottish side in the final. "It's been a fantastic run and we've beaten some good teams on the way and this experience today was fantastic," Morrison said. "I wish all the best to Ross County and I hope they go and win the league now and get into the Premiership because then it makes today's performance even better." Asked what he thought turned the game, Morrison added: "I think 3-1 flatters them and I think it would have been fair to go to extra-time, but I just thought, at the latter stages, Ross County probably had too much for us. "They pushed us back and I just thought there were periods when the players were not just physically tired but mentally tired."